December 15- Today we went to visit Santa. 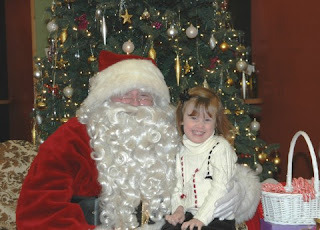 Once again, Savannah was thrilled to climb up on Santa's lap and have her picture taken. This year, she enthusiastically told Santa she wants a big Oopsy Bear (Care Bear) for Christmas. She has also started calling the big guy Santa vs. last year's Ho. December 13- Well here is another shot of my pregnant belly in all of its glory. It is hard to believe I potentially have another 4 weeks-- I am not sure how much more my tummy can stretch! 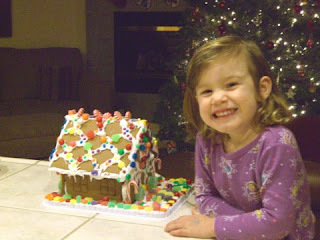 December 13- Tonight Savannah made a gingerbread house. I am not sure if she had more fun making the house or eating all the candy, but either way she is very proud of her creation!